Next Thursday, Bake-a-boo relaunches its “create and do” workshops with an open evening full of tea, cake “and something bubbly”. Head down to the shop on Mill Lane between 7 and 9pm to meet the workshop hosts. 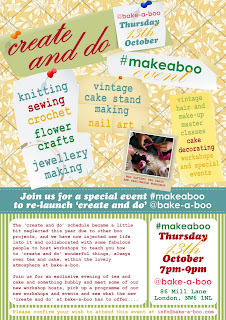 If you’re on Twitter, make sure you follow the #makeaboo hashtag for updates this week.